For some time now, I’ve wanted to post something from the island of Crete. The music of Greece is rich and diverse from region to region, island to island – it’s not all bouzouki and hashish dens (as terrific as that can be!). There’s Epirotic music with its Albanian similarities, Roumeli music, Thracian bagpipe traditions, and Pontic kemenje or lyra playing among other types. The deeper you dig, the more gold you will find. Kritika, or the folk music of Crete, is centered around the playing of either the three-stringed lyra, held upright and thought by some to be a descendent of the Byzantine lyra, or the violin, introduced to the region in the 17th century. Generally, most Cretan folk music is based around musical couplets or simple melodic phrases, called mantinidhes in the western and central areas of Crete, and kondylies in eastern Crete. The songs build in intensity as the violin or lyra player improvises. Dances, such as the pidhiktos or the pentozali, are performed. These musical phrases are part of the collective musical memory in Crete – as such, music in a performance is not always predetermined. Today’s piece is a hot one – and the title, “Kondylies Anamiktes me Askomadoura,” is simply a descriptive phrase: it literally means “Kondylies mixed with askomandoura.” The kondylies are the aforementioned musical phrases, and the askmomandoura is the Cretan bagpipe. Here’s where it gets interesting – the bagpipe is not played on this piece, it is imitated by the virtuouso fiddle player, Mr. Kalogeridis. I’m sure one can pick out the sections quite easily, but the violin-as-askomandoura occurs from 1:10-1:24, and from about 2:15-2:34. He is accompanied by an uncredited guitarist and pianist – though the pianist may be legendary rebetika musician Spyros Peristeris (1900-1966), who was the recording director for Odeon at the time of this recording (ca. 1938) and often was an accompanist on various instruments. Kalogeridis is considered a legendary fiddle player in Crete, although there are only about 15 of his recordings that have been documented. He was born in 1883 in Sitía, and studied at the Conservatoire de Paris until 1915, when he returned to Crete – the very first classically trained Cretan musician. However, despite being the chair of the Philharmonic Orchestra of Heraklion and his refined pedigree, Kalogeridis composed true Cretan roots music without European embellishment, basing his improvisations on folkloric lyra playing of eastern Crete. He also wrote down his improvisations – further, his compositions were so influential that they were passed down through oral tradition by other Cretan folk musicians. His first recordings were in 1926, and his last in 1950. He passed away in Piraeus in 1960, apparently having fallen on hard times to due a lengthy illness, and having to sell one of his prized violins for 7,000 drachmas. 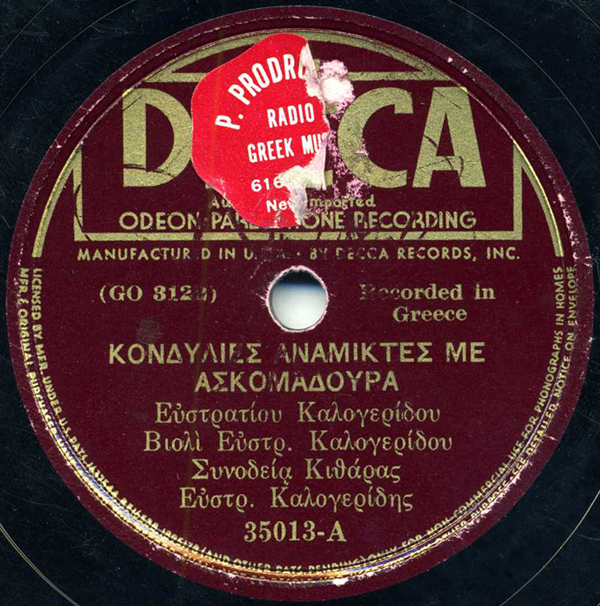 This American Decca release was taken from Odeon masters recorded in Greece, and distributed in the US in Greek communities and shops (this one still bears the sticker to a well-known NYC shop). The equally terrific flip side to this record appears on Vol. 2 of the Secret Museum series. And for an incredible down-home askomandoura performance, check out this clip. Many thanks to Tony Klein, who provided invaluable information for this post! Happy to see this post. Glad your energies haven’t moved entirely to the FMA. I remember seeing a 10-CD box set of Cretan 78s somewhere online a few years back, never bookmarked it, and some time after forgot what the website/label was. They also had a bunch of rembetika reissues. Does anyone know the name of this company? Tony will probably chime in here with the label name, as he has a copy – the title of the set is “Proromastores.” Apparently several Kalogeridis tracks are on there, but not this one. Nothing came up with that name. I did find some Cretan 78 reissue CDs over at http://www.hellenicrecord.gr/ They also have early music from Epirus, Macedonia, Rumelia, Aeolia, the Aegean Islands, and Turkey. It may be that it’s looong out of print – Tony will fill us in, I’m sure…he purchased it in Crete. Also, anyone with first-hand info on the Hellenic Record releases should give us all a heads-up on those! by the way…the sticker says “Prodromos music shop” which seems to have sold about half the greek 78’s in the USA, judging by the number of records I’ve seen with that sticker! Very true – a familiar place for those interested in Greek 78s. For Polish and Ukrainian music in the US, a familiar shop sticker is for the Surma Music Shop on 7th St. in New York – which is still kicking! oh yeah, I go to Suma for all my Ukrainian Easter Eggs! Love these posts! Thanks for some really great musical experiences! Better late than never….the reason Dax didn’t get a hit is that that 10 CD set is called Protomastores, not Proromastores; the word means the first/original masters. I agree with Dave, with the reservation that it lacks discographical information, and the mastering is not very good; as with many Greek 78 rpm reissues on CD they systematically ignore the capacity of a CD, 141 mainly 3 minute tracks on 10 CDs is a waste of good plastic on mother earth….the information is also a bit much on the romantic hearsay side of things. On the other hand it’s probably the only collection of its kind as yet so one doesn’t have much choice. The label belongs to Prodromidis record store, one of the major ones in N.Y., that had live listening booths, and carried just about anything, including bouzoukia.